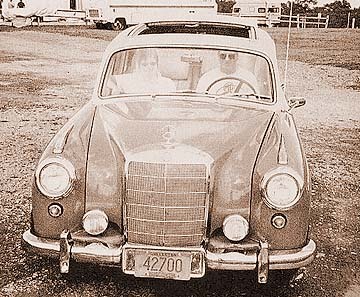 This photo shows Chris Williams and a friend (circa 2000) at the wheel of his 1958 Mercedes-Benz Type 220S sedan. This vehicle has an interesting history. It was originally displayed at the 1958 Chicago Auto Show. As such, it included every option that was available to Mercedes-Benz passenger vehicles of the period. Some of these were: a beautiful two tone paint scheme, dual Bosch fog lamps, a Webasto sliding sunroof, large dual head rests for the individual, fully reclining front seats, leather upholstery, Becker Mexico radio, Hydrak automatic clutch, and more. Today, the complete original tool kit is stowed neatly in the trunk. A Studebaker-Packard executive was the first owner of this 220S Ponton. Recall that Studebaker-Packard was the American distributor for Mercedes-Benz at the time. This graceful, full sized Mercedes-Benz sedan has been in Chris Williams' family since 1961. Chris is primarily a British sports car enthusiast, and is active in the MG Car Club Western New York Centre. He wrote a column based on his automotive trials and tribulations for the monthly MG newsletter, the Spokes, for many years. The idea behind the Hydrak automatic clutch technology is to provide an experience that requires driver input, and therefore is interactive rather than passive, but also eliminates the need to disengage the clutch repeatedly in city traffic. As the Hydrak began to age and hence develop various problems, many owners saw it as a chance to replaced it with a standard manual clutch. Thanks to Chris Williams for providing us with a detailed, first hand, operational description of this rare, and often misunderstood engineering feature. Are you curious what it's like to drive a Hydrak? Hop in and let’s take one out for a spin. We will take the 1958 220S sedan today. It's a car that has been in our family since 1961, and is considered a family heirloom. My daughter has already indicated that she has designs on the car when I decide I'm done with it. I have informed her, however, that it will be quite some time away. Take the driver’s seat and I'll coach you through it. Pull the choke out all the way and make sure the car is in Neutral. If you turn the ignition on, you will hear the vacuum mechanism operate when you touch the shift lever. It's a good test in an older car like this to ensure that the vacuum canister, which is located behind the left front wheel in the fender well, is not leaking. This car has been known to hold vacuum in the canister for up to a year of storage or non-use. I take that to be a healthy sign. Turn the ignition key all the way over clockwise, and then hit the starter button. Since we just had the car out yesterday, the two Solex carburetors up front should have full float chambers, and she will catch after about 2 or 3 throws of the crankshaft. As soon as she catches, you can ease the choke in to the halfway notch, and as she warms up you can keep easing the choke in until it is fully off. The white “choke” light in the instrument cluster will remind you that the choke is not fully off if we forget. I like to set the choke to where she is not missing, but keep some choke on until she's fully warmed up. Since she's not driven every day, she can be a little fussy about choke position and can be a bit “cold blooded” until fully warmed up. Ready to drive off? Let’s back her out of the shop where we just completed a tune up. Put your foot firmly on the big brake pedal first. Hydrak is not at all sympathetic about “subtly smooth,” and it unceremoniously “dumps the clutch” when we release the shift lever. We want to be prepared for this. The reverse gear is not synchronized, so let’s be nice to the transmission and just bounce off one of the other gears on our way to reverse. I like Second, but it is driver’s choice. Now haul the shift lever back hard and through the detent, and then up. Be sure your foot is on the brake, and release the shift lever. That big jerk or lunge we just felt was the clutch re-engaging. That is why I make sure I have the brake on when releasing the shift lever at a full stop. OK, now if you release the brake, she may walk herself out of the shop, but it could take a while. Just a little gas, and making sure we are “clear astern,” and we are underway. Notice that with the front tires aired up, the big wheel easily provides enough leverage to turn the front wheels as we back out. Now then. Just slip the transmission into Neutral and gently ease the brakes on to bring us to a stop. Once we are fully stopped, mash the brake pedal to the floor (the order of this is actually quite important) and pull the shift lever towards you as far as the detent, and then up to first. There is a game you will need to play with your wrist as you shift the column mounted lever through the gears. For First, Second and Reverse gears, your wrist should be “up,” or the palm of your hand should be facing you as you grasp the shift lever. For shifting to Third of Fourth, the palm should be down. I will clarify this as we get going. Again with the brake fully on, release the shift lever and accept the fact that everyone watching will suspect you can not drive the car as it lunges forward minutely but visibly and “hunkers down” on the suspension. This is something you will just have to get used to. With the car in gear, gently apply some gas and we just motor off. The shift point comes up quickly, and in fact the factory recommended that Hydrak cars start in Second on level surfaces. I prefer First, only because it minimizes strains on an older car, and I tend to shift around 3500 RPM or so, which I think is a healthy range for an engine of this age. Ready to shift into Second? Shifting this car, once underway, can be a bit tricky. You will have to lift first on the accelerator, and immediately touch the shift lever to disengage the clutch. Since we are going to Second, your palm should be up to ensure you stay in the “closer” set of gates in the shift pattern. Move the lever gently but firmly to Neutral and then straight down to Second. As you have done this, the engine RPM has been slowing down. Now comes the real trick. Done “just right,” you can release the shift lever at just the correct moment where road speed and engine speed in Second are exactly synchronized, and the shift will be flawless. Release the shift lever too early, and she will reward you with a boot in the back side. Release the shift lever too late, and she will “curtsy” for you. It takes some practice, and every now and then I still miss a shift. Sometimes, if I really boggle it and I know it, I will use the accelerator to bring the engine RPM up to where it should be prior to releasing the shift lever. There are multiple ways to attack this particular issue. Ready for Third? Palm down this time. Lift-touch, shift, pause, release. Push the lever up, drop it across the pattern and then up to Third. Again, wait just a moment for the engine RPM to slow down, and release the lever at just the right moment. There is no clutch pedal with which to control the engagement of the clutch, or to slow the engagement down or “sleaze it in” on this car. The shift is either flawless, or she will let you know what she thinks of your driving abilities. The shift to Fourth is probably the easiest, since there seems to be a natural timing here which closely synchronizes engine speed in Fourth and road speed. Palm down again, and lift-touch, shift, release. There – you can roll her right up to an indicated 75 on the speedometer and she will track straight and true. She will also do this all day. In 2000, my daughter and I drove her from Rochester, New York to Janesville, Wisconsin and back, a round trip of approximately 1500 miles, in honor of my father’s 90th birthday. The trip was done on interstate highways, and was trouble free. This really is a great old car. That curve ahead is tight enough that you will want to be in Third. There are two ways to get there. You could, of course, simply brute force the transmission into Third, or you could attempt a double clutch. No, really, it is not that bad. Here is what we are going to do. Just ease the shift lever into Neutral. Palm down, since we are going to Third and we want to stay in the lower gates. Now, in Neutral, release the shift lever, feed in some gas and pick the engine RPM up to what they would be for the correct engine speed in Third. Now, touch the shift lever and move it to Third. While you have your hand on the lever and the clutch is disengaged, again touch up the engine RPM so that RPM and road speed are “sweetly synchronized,” and release. See? It really can be done. I prefer double clutching down so as to preserve the synchronizers in the transmission. You could argue, I suppose, that I'm trading synchro wear for clutch and throwout wear, but I would argue back that a clutch job is cheaper and easier than a transmission job. It's a matter of choice, but I choose to double-clutch all my downshifts, even on the “fully manual” cars. Well, a major cross road will cause us to have to come to a full stop. If you feel like playing a bit, you can also double clutch your way down into Second. Palm up this time, since we need to lift the lever up through the pattern to the upper gates. Or, you could simply slow the car on the brakes, and shift into Neutral as the speed is bleeding off. Before you come to a full stop, however, shift the car into First and release the shift lever. Done at the correct road speed with the engine idling, the shift can be flawless. Now stop the car using the brake, but leave it in gear and let the torque converter absorb the energy while stopped. When ready to drive off, simply step on the accelerator and we are under way again. Now that you have been exposed to the subtleties of driving with the Hydrak, I suspect you will want to practice a bit, and having me watch you will not help. Drop me off at the shop, and take her back out solo. Remember, while performance can be somewhat “sprightly,” this is not a performance car. The Hydrak will limit your shifting speeds, at least if you choose to attempt silky smooth shifts, and keep in mind that “stately motoring” best describes how this car likes to be driven. I need to replace the carburetor float valves in the MG Midget, so you will have about half an hour or so while I have my attention focused elsewhere. Just one thing- I'm really fond of this car, so please bring her back looking and acting just like she was when you took her out. Have a great drive.